We spent the final two weeks of 2005 traveling around to some of the more popular tourist attractions in our little corner of the world. 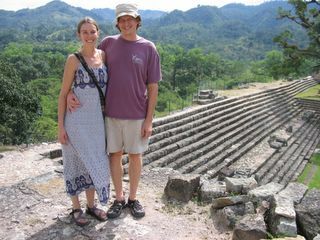 Our first stop took us to the Mayan ruins of Copán, just across the eastern border of Guatemala into Honduras. Like many of the ancient Mayan cities, Copán really flourished from about 200 years after Christ until sometime during the ninth century – more than 700 years, or 3 times as long as the U.S. has been in existence. 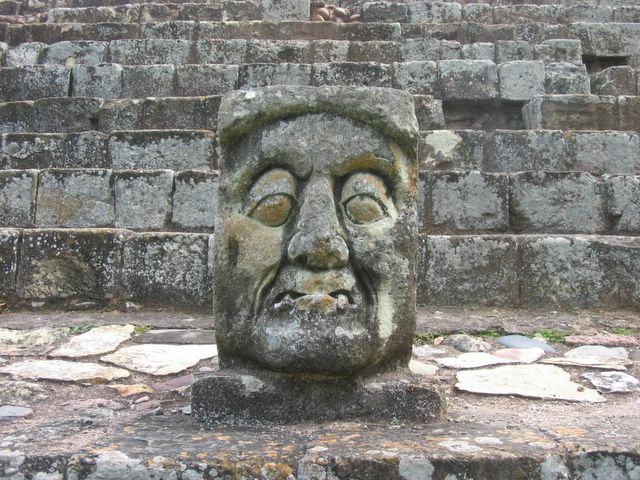 It’s estimated that some 70,000 people resided in Copán during its peak around the 6th and 7th centuries, when it was one of the most dominant cities in the whole Mayan region. However by the middle of the 9th Century AD, the entire Mayan civilization went through a marked decline, and by the end of the ninth century the city of Copán had been abandoned. Nobody is sure what caused the decline. Drought due to overpopulation? Intense volcanic activity? These are some of the prevailing theories. 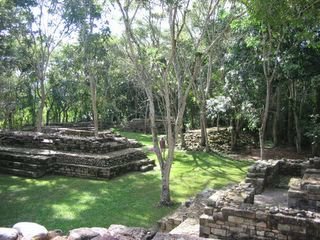 Either way, the city was overgrown by rainforests for centuries, and it was not re-discovered by explorers until the early 1800s, well after the Spanish had arrived in the early 1500s. 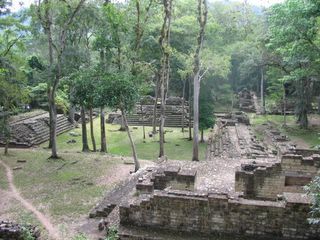 Today much of the site has been excavated and is easy to walk around. However archaeologists are still excavating some of the outer limits of the city, where the less impressive residential buildings were constructed. 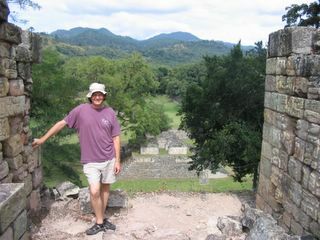 A view from the top of the acropolis that dominates the site. 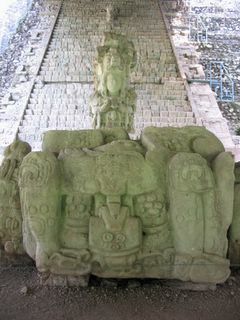 While Copán does not feature such an impressive array of gigantic temples and pyramids as other well-known sites like Tikal and Palenque, it does feature some of the most advanced and well-preserved artwork. 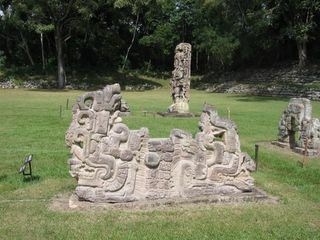 The stelae and sculptured decorations of the buildings of Copán are extremely detailed and are considered some of the finest surviving art of ancient Mesoamerica. Our guidebook says that if Tikal is the “New York” of the Mayan world, then Copán is the “Paris”. 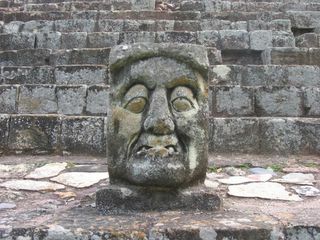 This hieroglyphic staircase is one of the most famous features of Copán. Supposedly it is like a giant history book, with all of the city's history carved into the various stones. 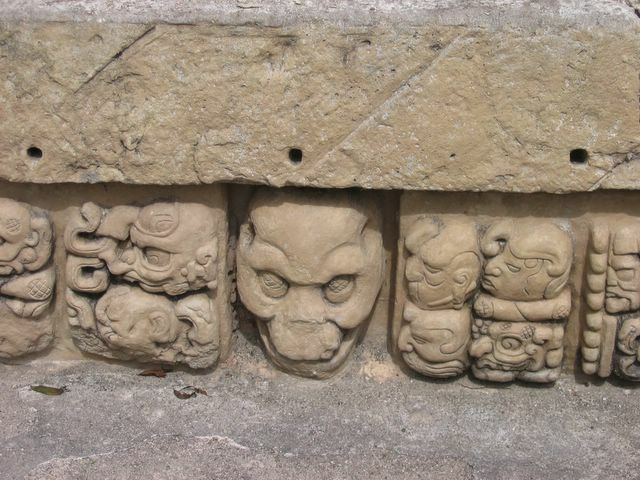 When achaeologists found the site, the carved steps were scattered on the ground and had to be reconstructed. Unfortunately, some of the key pieces now reside in various North American and European museums. 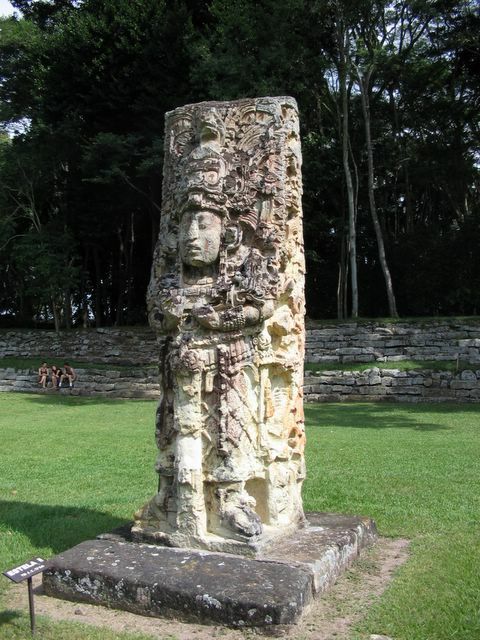 These statues, called "stelae", are the other features that make Copán famous. 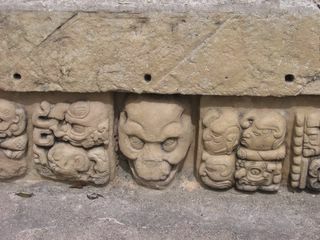 Many of the stelae represents the city's various rulers - more than a dozen over a period of around 700 years. The majority of the stelae were placed along processional ways in the central plaza and the adjoining "acropolis". 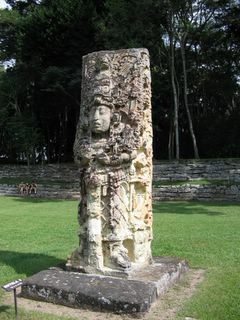 This stela represents one of the city's most famous rulers. 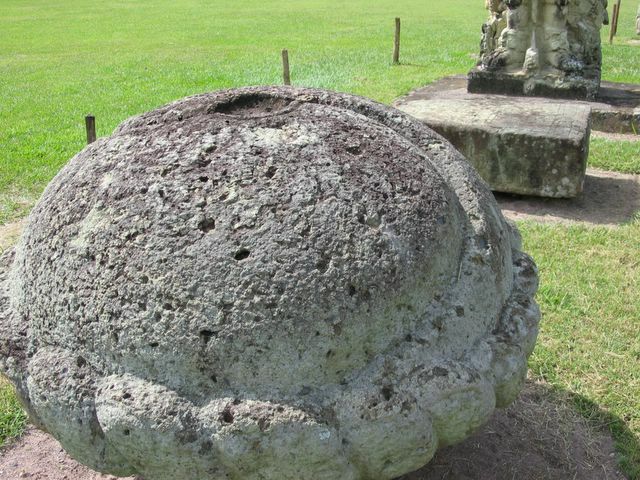 No, it's not a giant stone hamburger. 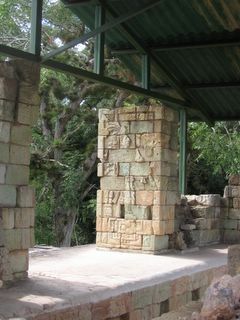 The purpose of this altar was human sacrifice. The sacrificial heart would be pulled from a living human body and placed in the indentation at the top of the altar. The curved channel on the side carried the blood off of the altar. This neighboring site at Copán, named Las Sepulturas (the graves), was a residential area for middle class Mayans during the peak of the city. The stone structures were the foundations of the houses, while the top halves of the houses were constructed from wood and leaves. The lower class supposedly lived in houses made entirely from wood, now long decomposed of course. 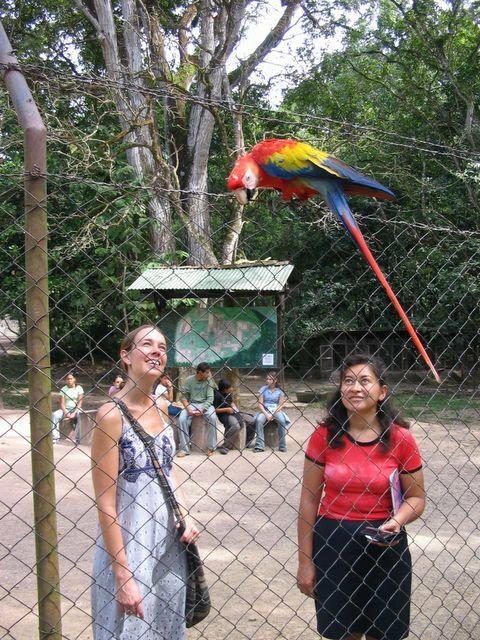 A scarlet macaw at the Copán site. The scarlet macaw is known locally as a Guacamaya. Unfortunately, these stunning birds, along with many varieties of parrots and quetzals, have been hunted to near extinction. The reason? To put them in cages in petshops and homes of uninformed people. For this reason it is almost impossible to see these majestic birds in the wild anymore. Although the scarlet macaw is native to this region, the bird in this picture has its wings clipped so that it can barely fly. It is a domesticated bird cared for by the Copán staff. 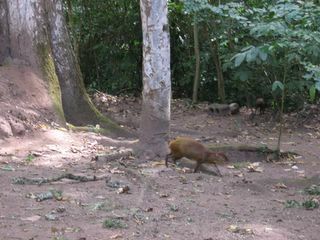 Another random animal at the Copán site. 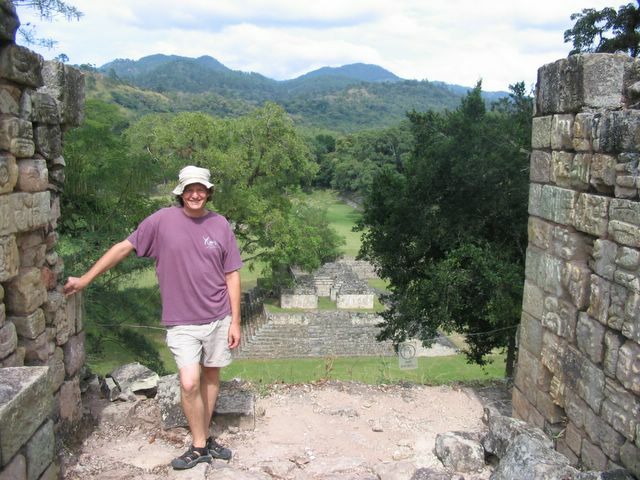 While visiting the site, we stayed in the small town of Copán Ruinas, only about a kilometer from the ruins. The town was quite pleasant, with a variety of very affordable lodging and restaurants. 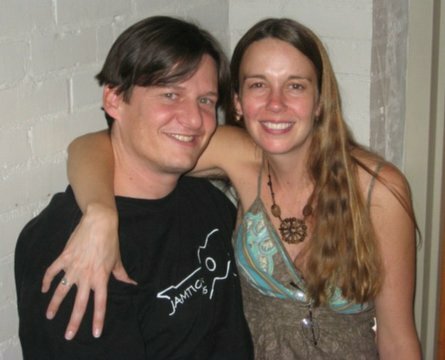 The locals were very obviously used to tourists, and we found everybody to be very friendly and accommodating. For lodging we ended up staying at a very pleasant backpacker hotel called Iguana Azul (Blue Iguana), owned by Howard, a gringo ex-pat from New York.